Last fall Ben's school had a function at a local skating rink. All of his friends were planning on attending, and he asked if he could go to. He said a friends parents would drive him if I could come at 8:30 and pick them up. I agreed and planned my evening accordingly. When I arrived at United Skates of America, I parked out front and wait for my son and his friend to come out. A car pulled into the space beside me and the guy inside waved. I quickly recognized the gentleman as a Cincinnati Insurance Adjuster, and rolled my window down to make conversation. I have known this guy for 12 years. We have worked many projects together. We have sat at a bar and had drinks at more than one Happy Hour. Our kids have even gone to the same school since they were both in kindergarten. So it was nothing to pass the time talking about old claims and industry issues. Par for the course when I get around people I work with. But then he said something that dumbfounded me. Have you seen this quiz on Facebook? The concept is simple. Women answer 10 little questions and the computer spits out how awesome the quizzees husband is, in percentage form. It asks questions like "what does he do when you have a bad day?" or "does he give back rubs?" All pretty basic, and I got positive results on most. But then she got to that one question. And it killed me. I will get to that in a minute. This week, Ben is at camp. 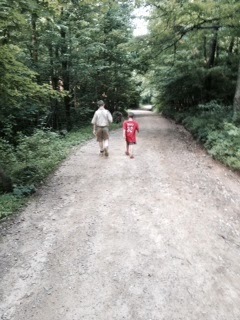 More specifically, he is with his Boy Scout Troop at Camp Falling Rock in the middle of nowhere, Ohio. We dropped him and his patrol off Sunday afternoon, shortly after returning from a 4th of July holiday that saw us spend a few days in Illinois with the family. And while I enjoyed that, and Monday's zoo day with Tanner and Little Red, I was anxious to see how my middle son was doing with camp life.